I think this is the best time to share stew recipes as Easter is fast approaching. I have shared chicken stew, mutton stew and vegetable stew in my blog already. So i thought of sharing a fish stew in this special occasion. As fish is the staple food in my native place Kerala (a south indian state), lunch is incomplete without a fish curry in most of the house holds of kerala. 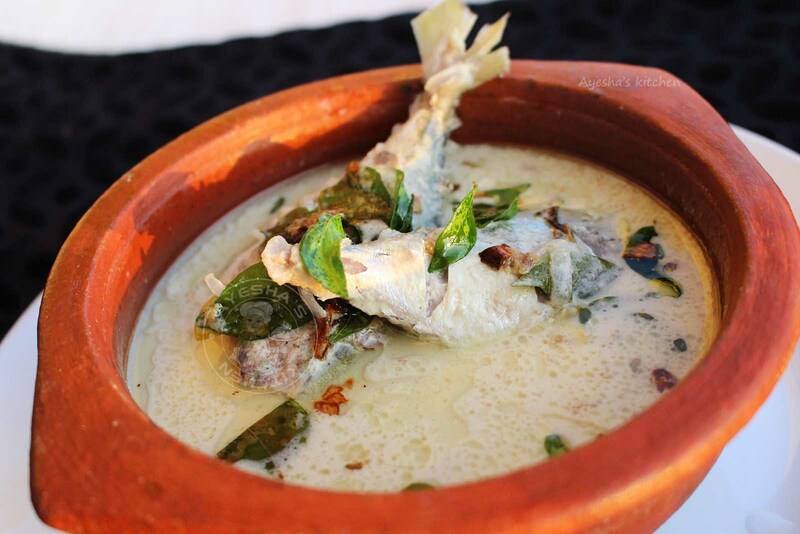 This recipe for fish stew is a malabar special fish recipe especially during the holy month of Ramadan for athazham. As this stew is commonly prepared by using Mackerel or Ayala, this curry is also called as Ayala kuruma / ayala korma. The freshness of fish used in this curry is an important factor. So use fresh fish steaks only while preparing this fish curry. 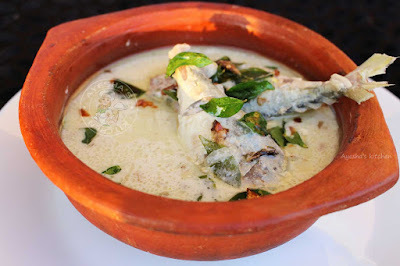 As we all know that every cuisines with a coastline have their version of stewed fish, this is kerala style fish stew recipe or Malabar special fish stew or ayala korma. No spice powders and no tomatoes is used in this curry recipe, still it tastes outstanding and sounds exotic too. The coconut milk flavor gives this fish curry a distinct flavor and aroma. Do try this easy and less time consuming fish curry recipe. It tastes best with steamed rice. Hope you all will try this recipe. Add chopped shallots, fenugreek seeds (uluva) and green chilies slit to a pan or clay pot (manchatti) along with some water and allow it to boil. Once it boils, add salt and some curry leaves. Stir well with a ladle. Now add cleaned sliced fresh fish (marinate with a tsp of vinegar ). Use fresh fish for fish stew recipes. And cook over medium flame until fish is done. Do not stir in between, instead swirl the pot or pan. When the fish is done, add the thick coconut milk. Swirl the pot to mix and check for salt. Remove from the flame before it starts to bubble ( very important). Do not let the gravy to boil after adding coconut milk. Heat a pan with coconut oil. Fry shallots chopped and curry leaves. Pour it over the curry for seasoning. NOTE: Preferably prepare this stew with fresh fish only as we are not using any spice powders in this fish curry recipe.